Meet at RTP Trails parking lot. Time: 8:45am There will be a brief safety meeting, handing out of tools and walking out to the trail work location. I will focus on a strict three hour work day. The task for this workday will be to armour, with rock, a few perpetually wet areas. We will be working with rock…gloves would be recommended. Some background material for rock armouring. 1. Start at the Bottom. If you’re working on a slope, start at the bottom and work upslope. The weight of the rocks will hold your work together. 2. Drop the Anchor. 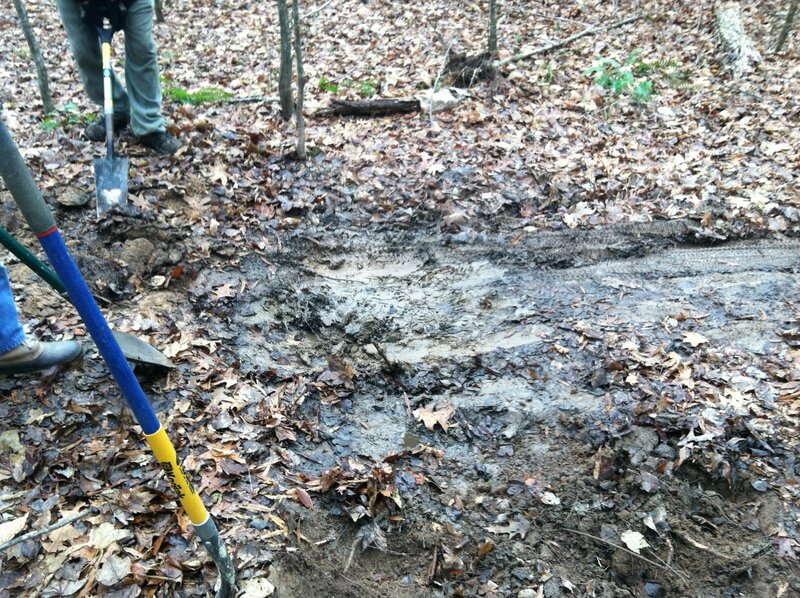 The first “keystone” in an armored trail section plays a crucial role in anchoring everything in place. The anchor rock must be large and immobile once set in place with at least two-thirds buried. Remember that angular rocks are better than round. Place a solid anchor every couple yards. 3. Laying the Tread. Once the anchor is solid, follow by placing more rocks to form the trail tread. Ensure all rocks touch one another and everything is locked in place. Like building a puzzle, you may need to move rocks around to find the best fit. If a rock wobbles under foot, reposition it. Use smaller angular rocks as wedges to fill gaps. Without mortar, friction and gravity must hold the rocks together. 4. Break the Joints. 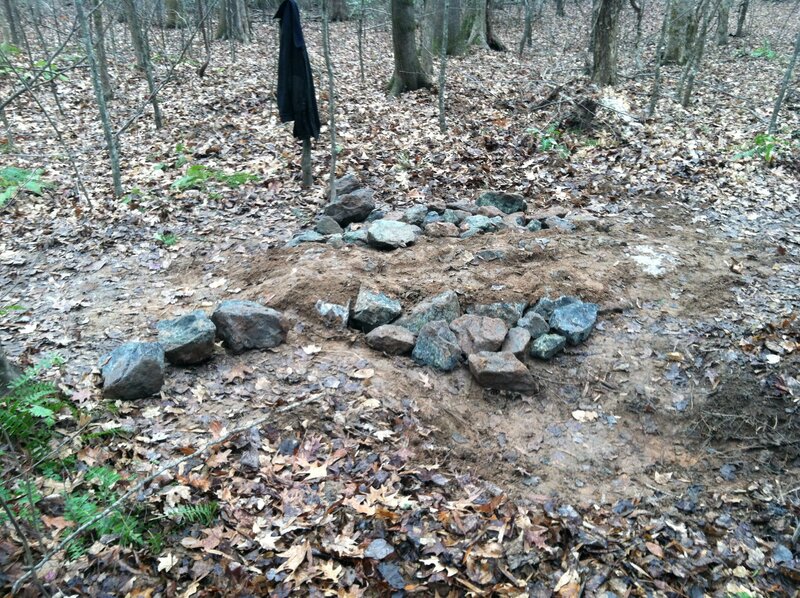 Place each rock so that it spans the gap between the adjacent rocks. Like building a brick wall, you must avoid directly aligning joints because they will weaken the structure. Each course of stone should overlap the cracks in the preceding row. Try to minimize lengthwise gaps that run parallel to the trail that might catch a bicycle wheel. 5. Use Tie Stones. Every four to six feet, place a larger stone that will span most or all of the trail tread. Like the anchor, a tie-stone helps lock everything together. 7. Compact. It is best to compact any surfacing material in layers while slightly wet. A mechanical compactor is the best tool for this key step. 8. Corral the Trail. Include something to define the sides of the armoring. Large ominous “gargoyle” rocks, logs, trees or other obstacles staggered on either side of the trail serve as physical and visual barriers to keep riders on the armored section of trail. Make sure the narrowing and the rocks flow naturally with the trail. Otherwise people will find it annoying instead of interesting, and may create a new route around it. 9. Consider Trail Flow. Smooth flow is vital on trails for cyclists. Mountain bikers love the rhythm of a trail where one turn blends into the next, and the trail surface is somewhat predictable. A trail with good flow helps minimize erosion, user conflict, and safety concerns. Strive for a subtle transition into the armored section.